In preparation for this first traditional charcoal drying of the Cascade hops, locally made charcoal had already been sourced and collected during the summer. 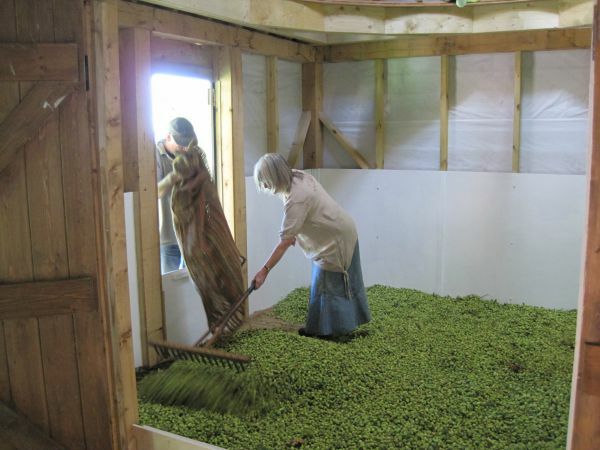 All other hop varieties had been picked and dried with an oil fired drying unit in the usual way used by growers today. 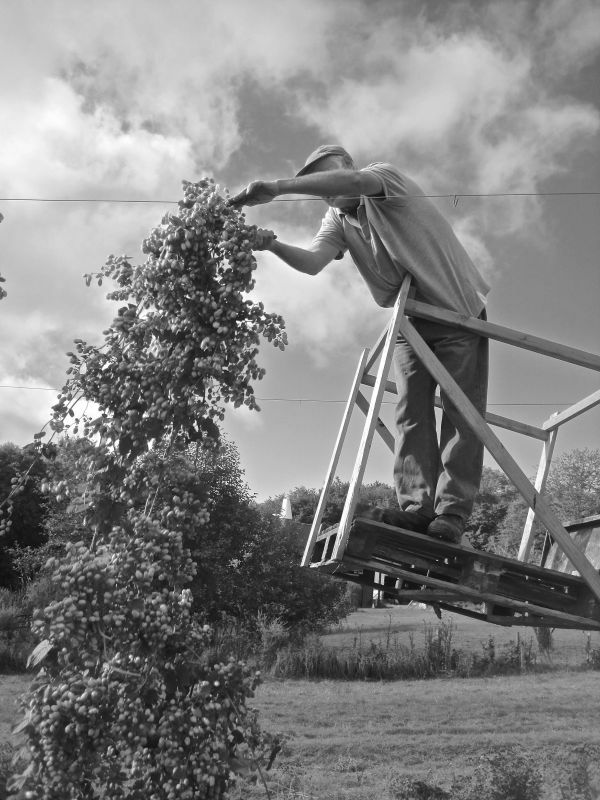 The late variety Cascade hops had been ear marked for this initial trial drying traditionally with charcoal. When the hops were picked last weekend, the weather turned out to be perfect for this first trial drying, it was a dry and clear day with a light breeze running. After the preceding wet week this felt like a good omen. There is only so much you can pick up from old books and hearsay from the very few remaining people who can remember cascade hops being dried with coal and charcoal kilns. Basically it had to be a practical hands on, ‘go for it’ , learning on the job experience. 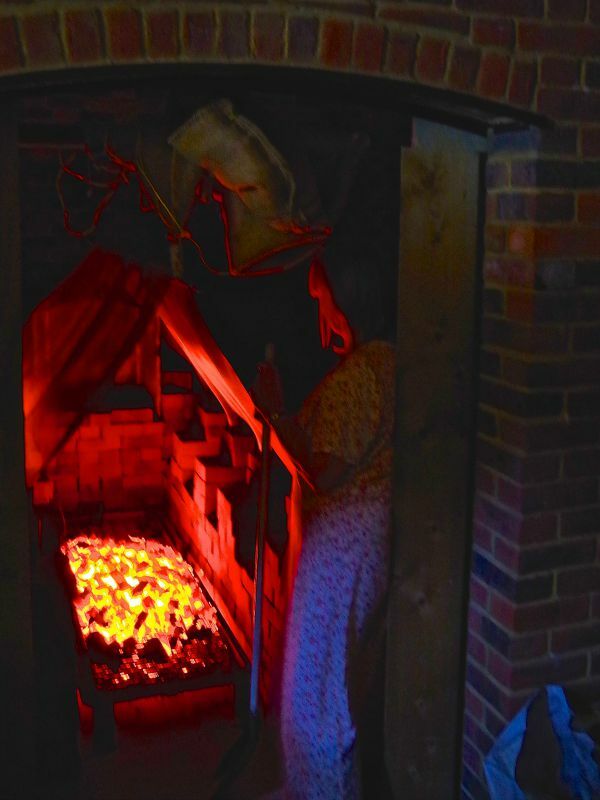 Of course it will take several burns before I become familiar with the many aspects of the furnace and the nuances of how the new oast behaves in different atmospheric conditions. The hops were loaded very shallowly compared to their oil dried counterpart loads but carefully raked level in the same way. I use a solid fuel rayburn to cook with so was hoping that this would stand me in good stead here. The fire was lit and because this was a venture into unknown territory, the size and heat gradually increased until the correct temperature was reached. Literally testing the temperature! It was a surprise how quickly the temperature in the kiln responded to any alterations with the draft. 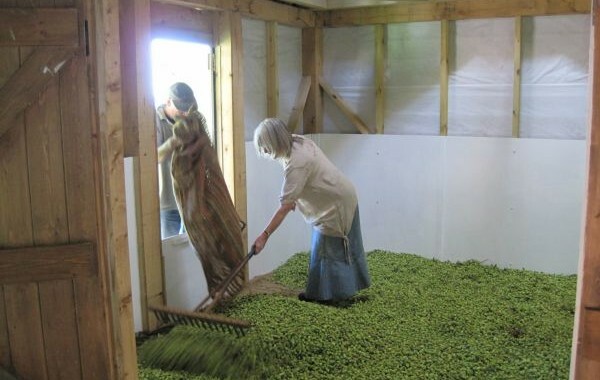 As the hops were approaching being dry the fire was allowed to die down before unloading them onto the cooling floor then as for any other load left for a time before being pressed. Have I already learnt masses? Yes of course and would I try things a little differently next time? Well again yes, I will make a few small changes, but certainly nothing dramatic especially for another year yet. And as for the finished article I am very happy with how things turned out with this initial trial drying. 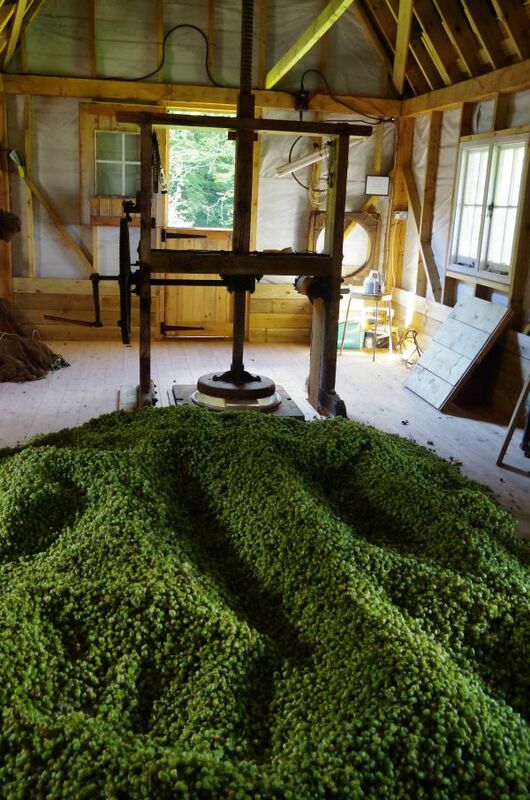 If you’d like to try some of these traditionally dried Cascade hops in your next brew, visit the Hop Shop now as we only have a very limited quantity this year.